The Chemical Review Committee (CRC) and the Persistent Organic Pollutants Review Committee (POPRC) are the scientific subsidiary bodies under the two conventions and play a central role in the process of listing new chemicals and advancing the technical work under the conventions. Both committees follow a number of processes and policies in reviewing chemicals for listing under the conventions. In their respective decisions RC-7/3 and SC-7/15, the conferences of the Parties to the Rotterdam and Stockholm conventions have invited the Secretariat to continue to undertake activities to support Parties and others to participate in effectively in the work of the committees. 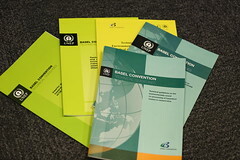 These activities are intended to serve as a platform to promote the understanding of the scientific and technical aspects of the conventions and facilitate the exchange of scientific and technical information among Parties, current and former members of the committees and other stakeholders so as to contribute to the effective work of the committees. The CRC and POPRC meetings will have balanced participation by observers including from developing countries and countries in economies in transition. POPRC invited experts will participate in the meetings of the Committee and provide expertise necessary to support its work. A Sub-Regional Workshop on Enhancing Effective Participation in the Work of the Chemical Review Committee and the POPs Review Committee was held in Lusaka, Zambia from 10 February to 12 February 2015. A Sub-Regional Francophone Workshop on enhancing effective participation in the work of the Chemicals Review Committee and the POPs Review Committee was held in Dakar, Senegal from 19 November to 21 November 2013.